For many large employers, those with thousands of employees, this is not news. By deploying private exchanges, they’ve been able to achieve exceptional cost and performance outcomes while gaining a strategic advantage over their competitors. For small to mid-sized employers, this is big news! Solutions that were once available only to the largest employers are now available to employers of practically any size. And, if you use your private exchange wisely, you too can enjoy a key strategic advantage over your competitors. So, let’s begin by looking at the circumstances indicating that participation in a private exchange may be a wise move for a small to mid-sized employer. For nearly 100 years, the primary method for people to access healthcare in the U.S. has been through employer-sponsored benefit plans. Now, we’ve reached a point where strategic thinking has largely been replaced by an annual train wreck of tactical reaction to an ever-increasing cost burden. Looking back, increases in annual medical spending tracked almost perfectly with the Consumer Price Index (CPI) until 1965. 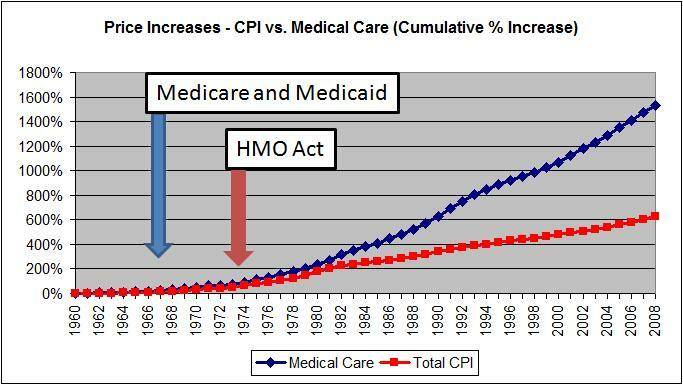 Every year since then, the increase in healthcare cost has exceeded CPI, sometimes by two to three times. What happened in 1965? That’s the year Medicare was introduced. We’ve been trying to tame the beast ever since. Despite the hype, benefits are simply a tool – one of many tools you can use – for recruiting and retaining employees. 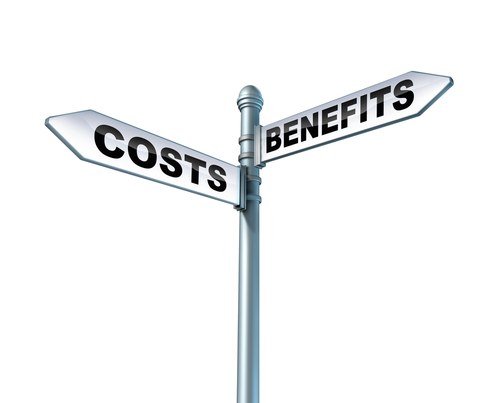 Which means the use of benefits has to align with your business strategy. Two factors are key here: Are you competing for employees with other employers and how much work are you willing to do to design, implement and sustain an effective benefits program? 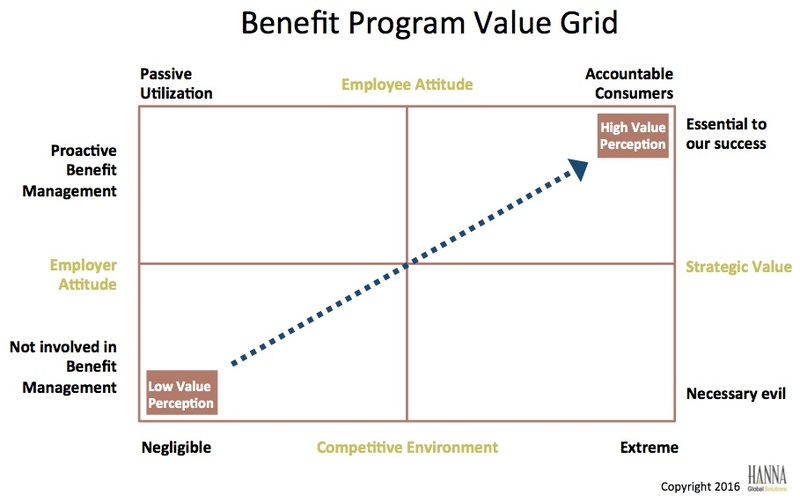 Using these factors and a couple of others, I’ve plotted a number of benefit solutions on The Benefit Value Grid. Your first task is to decide where your company lands on the grid. By that I mean, your strategy should dictate your approach. Starting with tactics first (switching carriers or plans to reduce benefits cost or increasing cost sharing or any of a number of tactics used to try to bend the cost curve) is the wrong approach. Don't let anyone tell you otherwise. So, for the sake of argument (and to make the rest of this blog relevant! ), let’s assume you fall in the upper right quadrant: benefits are important to your success, you’re willing to do the work, and you have clear outcomes you wish to achieve. While learning to connect wisdom to technology, I have observed what does and doesn't work when it comes to designing and maintaining a successful private exchange. From this, I have developed a very basic “how to” model for you to use if you are considering moving to an exchange or want to get more out of the one you currently use. You’re looking for someone with the experience and knowledge necessary to help you choose and actively manage the best technology available. As I said in Part 1 of this blog, the developers of successful exchanges now know that open, flawless, and fully mobile technology is the cost of entry into the private exchange game. A good advisor can help you find a provider who meets this new minimum standard. And, here’s a key distinction: you're looking for someone who takes responsibility for being much more than a broker. You’re looking for an advisor. This is an important development in the benefits industry. In the traditional world of the benefit drumbeaters, where benefits are seen as a commodity and one carrier is considered to be much the same as another, the broker has an arms-length relationship with vendors. Their job is to solicit bids on your behalf, present the bids to you, and let you decide which fits your needs… or, in far too many instances, which is the lesser of several evils. It’s much different with an “open architecture” exchange model; the more intimate the relationship between your advisor and the exchange provider, the greater the opportunity to innovate and improve. The capability to completely customize a solution does not just depend on technology; it also requires a collaborative partnership between you, your advisor, and the exchange provider. A good example of this type of capability – one that goes even farther and leverages the collective wisdom of many advisors and the pooled purchasing power of many employers – is the private exchange created by United Benefit Advisors (UBA) called Benefits Passport. If you are making the switch from a fully insured to a self-funded plan hosted on a private exchange, the good news is your basic plan design is most likely going to look very similar to what you’ve done in the past. That’s because offering benefits that fit your strategic needs makes sense regardless of the funding method or technology used (or not used). Even better news is that, with an open architecture private exchange, you can weave your strategy into every element of the employee experience. You can purposefully customize each interaction your employees have with the exchange and its associated technology. Sound like a lot of work? There’s no denying it does take time, effort, and strategic thinking. But, if you think about the traditional, annual rehash of frustrating cost control tactics that slowly gut the value and effectiveness of your plan without actually controlling costs, then perhaps there is sanity in taking a longer view and doing the work. If you do take this on, the big promise you realize is that next year, instead of going back to the drawing board to find new ways to scrimp and save, you can actually use the data and information the exchange provides to build on the foundation your plan has created. The "lather, rinse, repeat" madness of a traditional renewal becomes a thing of the past. The monster that annually emerged from the closet is permanently locked away. For example, during and after enrollment you can continuously reinforce your company’s commitment to its employees. The opportunity to brand your benefits to achieve greater loyalty and engagement – not to mention greater appeal to would-be employees – can be realized by including education about the why behind your benefits plan. Telling your employees why you think benefits are crucial to their (and their families’) well-being and success, and why you want them to have the best possible plan, can be easily facilitated on an open architecture private exchange platform. During enrollment, the best employers provide education, information, and support to empower employees to make the best choices for them and their family. In Part 1 of this blog, I proposed new breakthroughs occur when employers and their advisors adopt an open attitude toward the way they and the employees can put the technology to use. A subtle but important concept here is to be open to the idea that the technology, no matter how functional, may be a poor replacement for real, live human interaction. Traditionally, after enrollment, employees contact insurance carriers directly when they use their benefits. With a strategic, purposefully designed plan, one including ongoing employee engagement, you can help employees not only better manage carrier interactions, but also help them become aware of and more discerning in choosing cost-effective care options. You also have a continuous opportunity to nurture and reinforce an overall healthier approach to life. Which, of course, is a wonderful way to reduce plan cost: fewer claims = lower cost! A caveat: there is a natural sequence to engaging employees and creating a culture of health and well-being accountability. You must first educate and motivate employees to become active participants in benefit utilization before you can engage them in becoming more active in their own health management. There are two additional items to consider while designing your plan. First, exchange providers have the opportunity to have better, more aligned relationships with preferred carriers. Similar to the new, more collaborative relationship advisors have with a preferred exchange provider, with carriers, it can lead to preferential products and services being made available on the exchange. Guiding employees to these preferential options helps you control cost while enhancing the perceived and real value of your benefits program. Second, private exchange technology can make it a lot easier for you to meet regulatory and reporting requirements. During plan development, be sure to take advantage of as much compliance automation as possible. Cited earlier, UBA’s private exchange, Benefits Passport, provides two examples of how an open attitude impacts technology utilization. First, UBA’s private exchange gives employees access to live human advice, assistance, coaching, and advocacy where it is most needed. Second, “openly” acknowledging where their expertise begins and ends motivated the Benefits Passport team to form a strategic partnership with a technology-based employee education firm called Touchpoints. The integrated platforms enable employers and their advisors to fully customize the communication component of every interaction employees have with the exchange and with their benefits. It’s your data… use it! Finally, modern private exchange technology gives you the information you need to accurately measure the effectiveness, expense, and impact of your plan design and delivery. Instead of being clubbed each year by trend, the carriers’ favorite cudgel, and instead of making decisions based on someone else’s information and opinion, you now have the opportunity to make sound decisions based on facts. To do so, you must insist on complete transparency wherever possible. And, perhaps more important, you must be willing to take an open – there’s that word again – and honest approach to accepting what the data is telling you. The last word… until Part 3! It is important to repeat that this is a long-term strategic process that begins with creating the best possible platform for progress and then working with your advisor and all other key partners to learn as you go. I believe the future of healthcare delivery lies beyond exchanges, but we must walk before we can run. Turning the promise of modern, technology-empowered employee benefits programs into reality, now and in the future, requires adopting a modern, three-pronged approach.